I have a considerable stock of interesting tonewoods: woods which I carefully select. All the wood I use is from trusted, legal sources, much of it ‘old stock’. 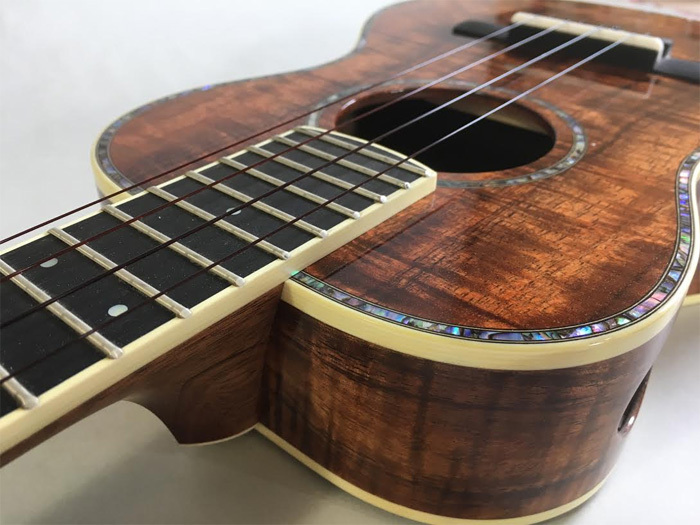 After building different models for over 23 years I now concentrate on building two styles of tenor ukulele - the Hawaiian style and the Californian style. For Hawaiian Style Tenor ukulele (HST) I use koa that comes from either the Big Island of Hawaii or Maui that is figured. However because of limited supplies and increasing costs importing this wood I have introduced a type of African Afara which I call Blackline Korina. 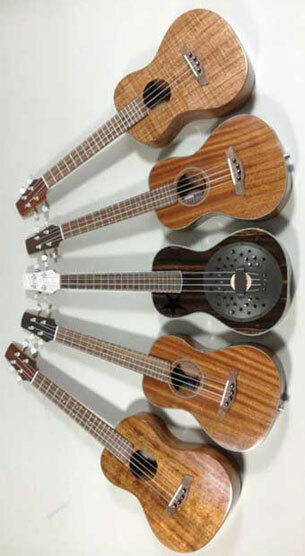 It is stunning and produces ukulele equal in power to those made on koa. I use makore, cherry, walnut, mahogany, rosewood, korina and myrtle for the bodies of my modern Californian Style Tenor ukulele (CST). I stock Alpine moon spruce, Englemann spruce and red spruce as top wood for these modern style instruments. Fingerboards and bridges for all instruments are made from Tanzanian Leadwood or Indian ebony. Bindings are made from traditional celluloid. I use Der Jung, Rubner and Gotoh tuners. I do not fit any other types of tuners except when requested. If you do have a preference please consult with me before you send them to me so I can advise you on alternatives if necessary. I do not fit Peghed tuners. For a comfortable playing action at both the nut and the dusty end of the fingerboard, all instruments have a nut width of 36mm with 10mm string spacing at the nut, 40mm spacing at the saddle. I do not recommend custom nut widths - my instruments are universally praised for their ease of playing. For the nut and saddle I use Corian™. I use Worth Brown strings exclusively. If you have a preference for strings, when receiving an email from me that I am starting your build, please send me two sets of your preferred strings because changing to a different brand after the instrument is in your care has implications for the overall setup of your instrument. I use two finishes – a matt lacquer and nitro cellulose gloss lacquer. Unless stated, all instruments have a matt finish neck. HST are matt finished, gloss finished bodies are an upgrade for this model. CST are gloss finished unless otherwise requested. All finish work is currently done in house. All instruments come with hard shell case. Please use the menu on the left to browse my instruments or go to the shop to see what is available.